This book contains all of the diaries, programs, essays, and major articles written by Alexander Rodchenko between 1911 and 1956. The word 'experiment' was a key word for the artist, who conceived of his multimedia oeuvre as one huge experiment. Referred to by his friends and contemporaries as 'a scout of the future,' Rodchenko sought new paths in graphic design and painting, sculpture and architecture, poster design and cinema, photography and book design, and furniture and theatre design. The first chapter in this volume covers the early life of Rodchenko and relates to the time of his studies in the Kazan art school. His diaries from 1911-15 relate the vivid atmosphere of the school, explain the artist's early tastes for theatrical, oriental and medieval motifs, and recall the moments when he first met Varvara Stepanova, his lifetime partner and fellow artist. The second chapter covers the most active years of the Russian avant-garde movement: 1916-21. Here Rodchenko is linked to Vladimir Tatlin and his evolution as a non-objective painter comes about. His writings from this period explore his interest in the artistic process, in the way ideas are born, and often make comparisons with other artistic trends of the time: suprematism, cubism, and impressionism. The third chapter runs through the 20s and the height of the constructivist movement, when Rodchenko became one of the leading designers of the time. This chapter is the most comprehensive, featuring writings dedicated to industrial design education, graphic design, advertising, photomontage and photography. The fourth chapter reveals the artist's mood and the general Soviet culture situation of the 30s, a time of political change, accusations of formalism, and great success in photography. The last chapter is dedicated to the war and postwar period and contains only diary texts in which the artist recounts his family's evacuation to the country, his subsequent hard living and working conditions, as well as his musings on the cultural politics of the time and life in general. 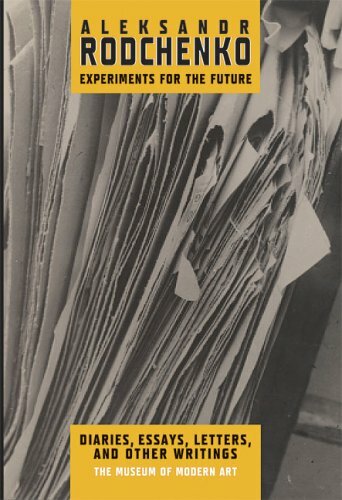 Originally published in 1996 in Moscow by Rodchenko's family, Experiments for the Future appears here in its first English edition. This new edition contains additional material and features a different design and images, but the content remains essentially unchanged.